This may be one of my favorite things that I have ever made myself. 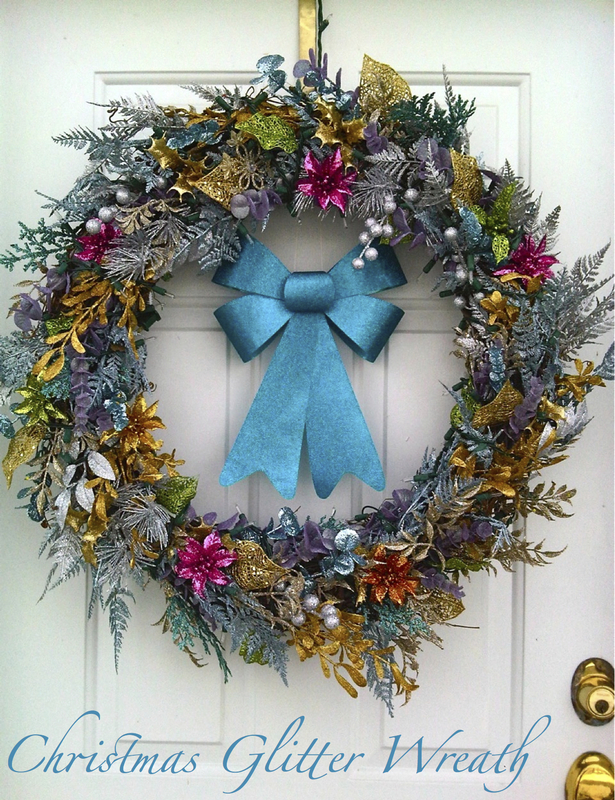 I love the idea of having the wreath you put on your front door for Christmas time being a huge statement. If you’re having house guests, it’s the first thing they see and sets the tone for the rest of the house and if someone’s just driving by it’s the only thing they’ll see of you. Because of this, I set out last December to make a huge wreath that just screamed out for attention and I think I accomplished that. Like I said, I made this last year so I won’t be able to give you the usual step-by-step tutorial on how to make it yourself. I did, however, have to add a few pieces this year because of wear and tear from last years NY winter so I took some pictures then. I got everything for the actual wreath from our Joann Fabrics, the only thing I didn’t get from there is the big blue bow in the middle and that came from Target. 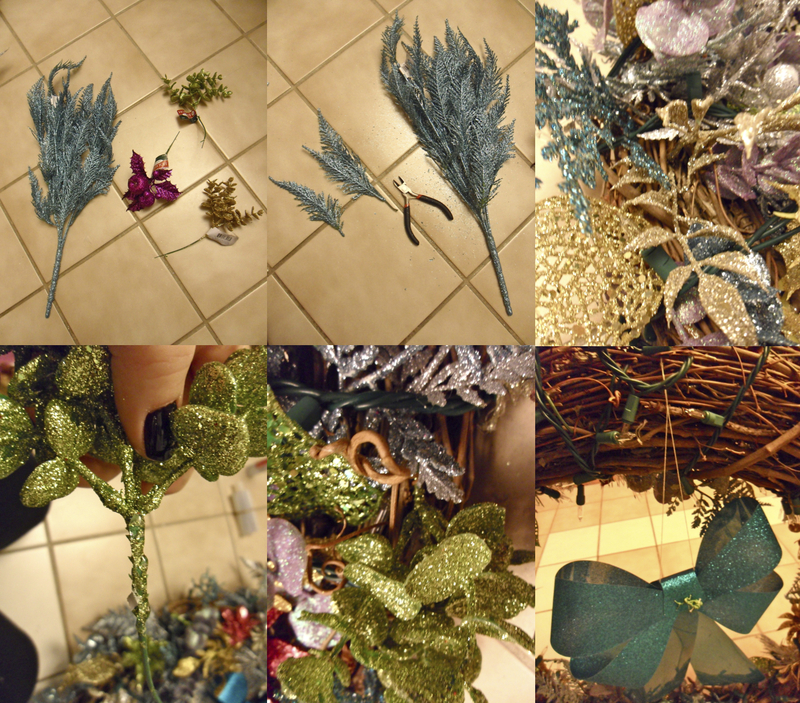 I started with the biggest grapevine wreath form they had (I think it’s a 24″), 8 bunch glitter picks and about 30 single picks. The picks are the same ones I used for our Christmas tree. They can be found in the floral section and they have SO many of them come December. Flowers, leaves, fruit, snowflakes, poinsiettas, etc… just grab as many different shapes and colors as you can. The bunched picks come just like that, bunched, so I took wire cutters and separated the individual branches out. The single picks I just left exactly as is. Start from one point on the wreath and just start adding the picks. Leave the stems long on the pieces and just put hot glue from a gun near the base of the flower or leaf. Stick the stem inside the grapevine and secure the leaves with the hot glue. 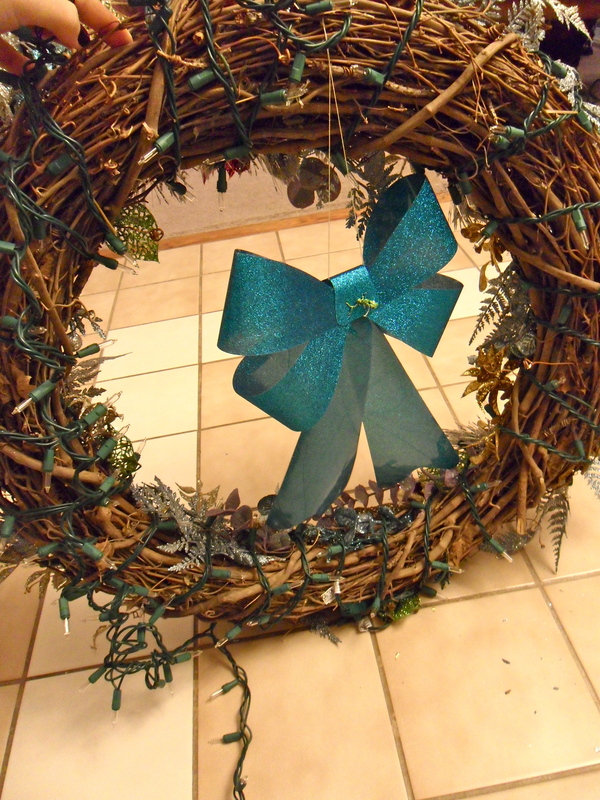 Start building around until the whole wreath is cover and then go back and fill in any holes. The bow i got from target is plastic which is perfect because I don’t have to worry about the moisture from the snow ruining it. I just took a piece of thread, looped it through the bow and tied it to the back of the grapevine. After the wreath is filled in how to your liking, take a long string of outdoor lights and just wrap it around the wreath. This is a little tricky, because you still want the leaves and things to “spray out” but if you just try and get the lights in between them it’s not that difficult. 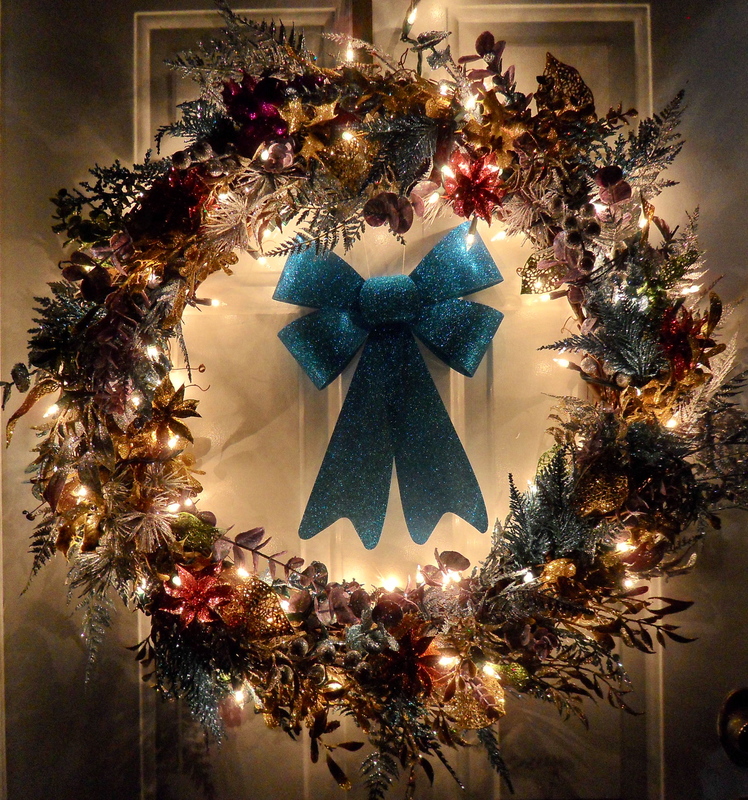 Here’s a picture of the back of the wreath so you can see how the lights wrap around. This wreath held up incredibly well… we had a pretty bad winter last year and all the picks stayed on and it stayed looking beautiful. We set it up against one wall in our garage in the process of taking down decorations last winter and never ended up putting it away, but as you can see it still looks exactly the same! This project takes a lot of patience but it is SO worth it in the end. The colors are so vibrant, during the day it stands out so well in contrast with the nothing but white that the snow brings… and at night the lights hit the glitter and it sparkles so bright you can’t help but notice it! omg that’s gorgeous! One of the best I’ve seen!! !